Wow, two gorgeous Vincents up for sale at the same time! Although I’d imagine at this point, given their value, many of them are in this kind of condition. Yesterday’s Rapide had been cosmetically modified to look more like the blacked-out and sinister Black Shadow. This one is a few years older and stays a little closer to its roots but is no less desirable for that. Based on Vincent’s own Meteor/Comet 500cc single, the 50° twin was powerful, a worthy motivator for a true “superbike.” It is also one of the best-looking engines of all time: elegant, brutal, and purposeful, but this beating heart is, in some ways, the most conventional part of the bike. Introduced at a time when three-speed, tank-shift gearboxes and rigid frames were the norm, the Vincent must have seemed shockingly exotic. 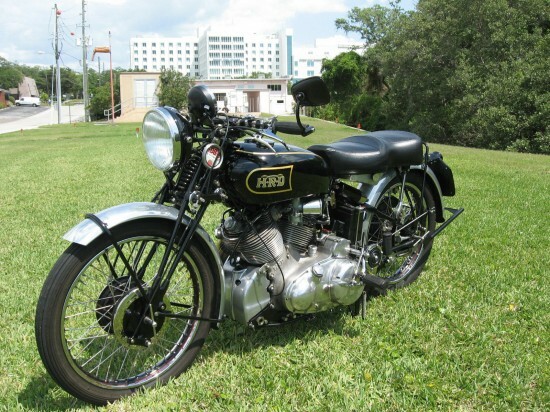 In addition to the swingarm rear suspension, four-speed foot shift, and unit construction for the engine and gearbox, the Vincent skipped right past the next sixty years or so and basically eliminated the frame entirely with their Series B bikes, with various sub-assemblies bolted directly to the engine and gearbox. The bike also featured Vincent’s own “Girdraulic” alternative front end. Although girder front suspensions weren’t all that uncommon at the time, Vincent’s resistance to the new wave of telescopic forks was based on the inherent limitations of that design, namely stiction and flex. This is something that modern designers still struggle with and the ubiquity of telescopic forks on modern bikes speaks to the difficulty in designing a simple and effective solution. Bikes like the Britten V1000, Bimota Tesi, and Yamaha GTS1000 have all used effective alternatives, but those designs never took off or became mainstream. Only BMW’s “Telelever” suspension has had any significant success. 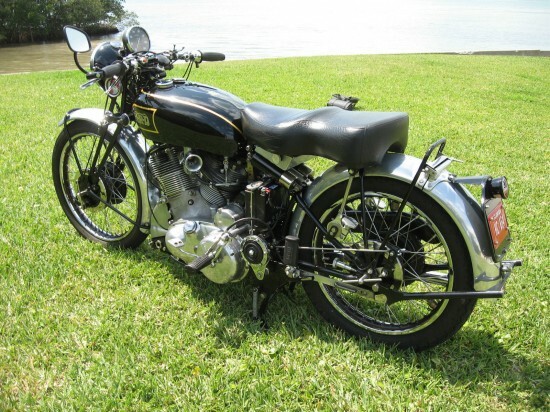 Vincent’s v-twin was offered in two flavors: Rapide and Black Shadow. The bike being offered is a Rapide, not the higher-performance Black Shadow, although significant internal upgrades have likely erased any performance deficit. A ‘regardless of cost’ restoration was carried out with Brampton forks rebuilt by Ray Daniels, the correct Miller headlight and Alton alternator. Central Wheel Components built the English chrome wheels with the correct 20″ front and 19″ rear rims linked by stainless spokes and ribbed brake drums, with period brake plates with no water excluders. Alloy ‘guards were specified with a Koni rear damper. 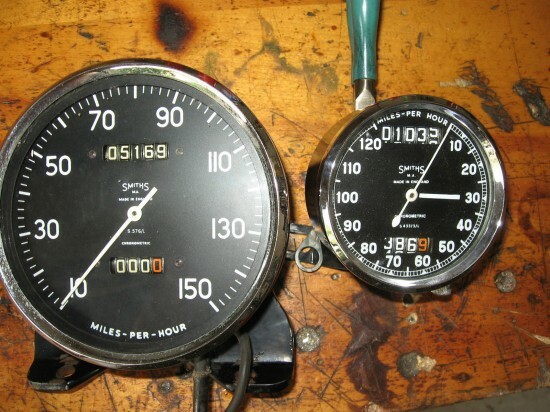 The ignition is by Lucas KVF magneto with a conversion to slack-wire advance system by Barry Basset. The tank was checked, painted and HRD-lined, with a new seat and tool-box assembly. After the return to the ISDT machine of its original engine, 335, a 1947 twin, was installed. From a Rapide exported to Canada, this engine was fitted to a Norvin built between 1957-60 by one Pat Heardley of Montreal who worked for the Atomic Energy Corporation and had access to special tools and re-finishing equipment. Equipped with 32mm GP Dellortos, 10:1 pistons, special cams and all surfaces anti-friction coated, it was used very successfully for racing by VOC member Dave West at Mosport, Shannonville and Nelson Ledges. For installation in FYG 413, it was enlarged to 1,116cc capacity with 32mm Mark 1 Concentric carbs, Suzuki pistons and flywheels polished and balanced trued to zero run-out. These were balanced by Ken Roseover, a works engineer for Bombardier/Can-Am. 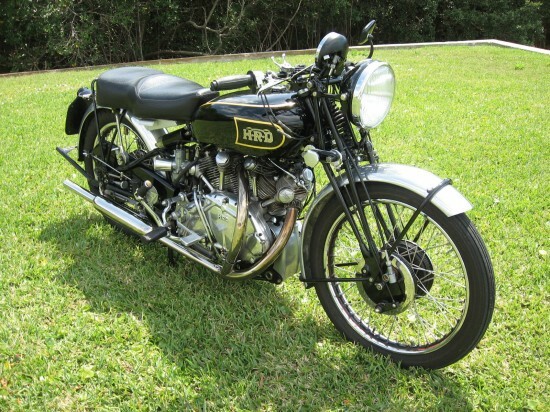 To simply, this is a non matching numbers bike. The performance of the machine is greater than that of a standard Rapide and may be greater then a Black Shadow. The electric starter is not installed. I will supply all that is needed to install the starter motor if you wish to do so. 12 volt system uses a larger battery- most likely to fire the starter. I have always started the bike the traditional way. It is indeed a thrilling machine to ride. At 450 pounds motivated by 45-55 very torquey horses, the Vincent is a vintage bike that needs make no apologies or concessions to modern traffic, assuming you’re wary of the bike’s period drum brakes and infamously unforgiving handling. 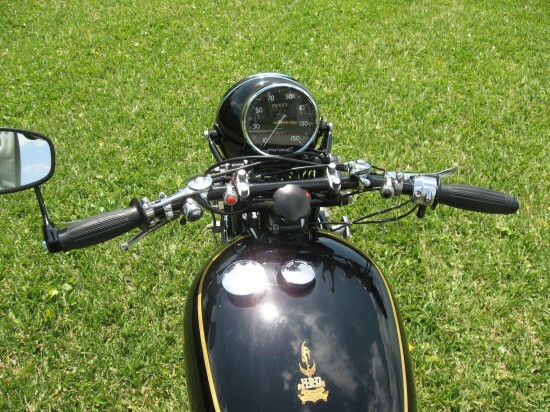 As you may have noticed in the listing, the bike is available with the choice of two different speedometers. The larger, pie-plate sized item is a very iconic look for a Vincent, but I think I actually prefer the underhand sweep of the smaller, more conservative 120mph item. Luckily, you have a choice! It’s obviously not a numbers-matching machine, and the reserve hasn’t been met yet, but the bidding is still at pretty bargain Vincent levels. I’m curious to see what this one goes for. Instant Vincent collection, just add cash.